Our Best Bet last night on the Avalanche/Coyotes Over 5 fell way short as Arizona triumphed 1-0 in a game that made your eyes bleed. The rest of the leans went 3-3, with the early games hitting but the late games falling short. There are 8 games in the NHL tonight (it was originally supposed to be 9, but Jets/Devils was postponed due to the snowstorm on the east coast). The game of the night is obviously Wild at Capitals, a clash of conference leaders. What’s fascinating about this matchup is that neither team has been playing very well lately, most noticeably the Capitals who have lost 4 in a row, so we should get 2 hungry teams tonight. Though Minnesota has the Blackhawks right on their heels for first place in the West, it looks like Washington should be the more desperate team tonight. They’ve also got a great track record in “step-up games” this year at home. If you want to bet the Capitals, instead of laying -130 or higher against a very tough Wild team that has won 16 of 21 on the road, you might want to shoot for a bigger score at plus money. Considering the Caps won 3 of those 4 games listed above by 3+ goals, and that 27 of Washington’s 37 regulation time wins have come by 2 goals or more (20 of them by 3+), Capitals -1.5 +220 might be worth a shot. If Washington comes out absolutely flying, you can really cash in. Alright, onto the game breakdowns. Good luck with your bets! Reasons to bet Minnesota: The Wild has won 16 of its last 21 road games. Washington has lost 4 straight games, giving up 4+ goals in each of them. Reasons to bet Washington: Several Capitals players have said their current losing streak is a “wake-up call” to start playing playoff-style hockey. Minnesota has lost 3 of its last 4 games and allowed 4+ goals in 6 of its last 9. Reasons to bet New York: The Islanders have won their last 6 games following a loss of 3 goals or more. Carolina has lost 6 of its last 8 home games and 11 of its last 15 overall. Reasons to bet Carolina: The Hurricanes are 6-0-2 in their last 8 meetings with the Islanders and have scored 20 goals in 3 games vs New York this year. New York has given up 3+ goals in 6 of its last 8 games. Reasons to bet Chicago: The Blackhawks have won 8 of their last 9 road games. Montreal has lost 5 of its last 7 games at home. Reasons to bet Montreal: The Canadiens have won 8 of their last 9 games. Chicago was outshot 44-22 in a 4-2 win over Minnesota on Sunday, and had lost its previous 2 games. Reasons to bet Tampa: Tampa is 6-1-1 in its last 8 games and has allowed just 6 regulation time goals in its last 5. Reasons to bet Ottawa: The Senators have won 6 straight games, holding opponents to 2 goals or less in each of those wins. 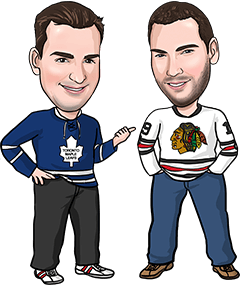 Reasons to bet Toronto: The Leafs have earned points in 8 of their last 10 games (5-2-3). Florida has lost 8 of 9. Reasons to bet Florida: The Panthers have recorded 40+ shots on net in 4 of their last 5 games. The Leafs have allowed at least 2 goals in 9 straight games and 3+ in 5 of 9. Reasons to bet Dallas: The Stars have won 7 of their last 9 visits to Edmonton. The Oilers have lost 5 of their last 7 games, and allowed 3+ goals in 7 of their last 9. Reasons to bet Edmonton: The Oilers should bring some urgency tonight after losing 3 straight home games and with the Bruins up next on their schedule. Dallas has lost 22 of its last 30 road games. Reasons to bet Arizona: The Coyotes are 3-1-1 in their last 5 games. The road team has won 7 of the last 8 meetings. Reasons to bet Los Angeles: Desperation time for the Kings, who are 5 points out of a playoff spot after last night’s loss at home to St. Louis. Arizona has lost 16 of its last 21 games on 0 days rest. Reasons to bet Buffalo: The Sabres have somehow won 9 of the last 10 meetings and are 17-5-2 in their last 24 versus San Jose. Buffalo has scored 3+ goals in 4 straight games and 6 of 7. Reasons to bet San Jose: The Sharks have won 6 of their last 8 games and are 22-8-4 at home. Buffalo has given up 3+ goals in 9 of its last 10 games.